An ancient sunken ship was discovered at a construction site in Heze in east China's Shandong Province in September 2010, which was later covered by domestic media. The ship was made in the Yuan dynasty (1271-1368) and is the oldest sunken ship ever found in Shandong, according to information from a press conference jointly held by the Shandong Provincial Institute of Cultural Relics and Archaeology, Heze Municipal Government and the Heze Municipal Institute of Cultural Relics and Archaeology on Nov. 23. Archaeologists salvaged some 110 cultural relics, including a nearly intact blue-and-white vase with dragon designs worth well over 100 million yuan, from the ship. An archaeologist, who declined to give his name, said that the cultural relics unearthed from the ship are priceless even if measured in money alone, especially three Yuan dynasty blue-and-white porcelains found in the rear cabins. The 42-centimeter-high blue-and-white vase with dragon designs is worth well over 100 million yuan, which is rare in China. "I once said jokingly that if the vase is priced at 200 million yuan, or the 110 cultural relics are priced at a combined 1 billion yuan, I will immediately apply for a loan to buy them," the archaeologist added. Why are the Yuan dynasty blue-and-white porcelains so valuable? 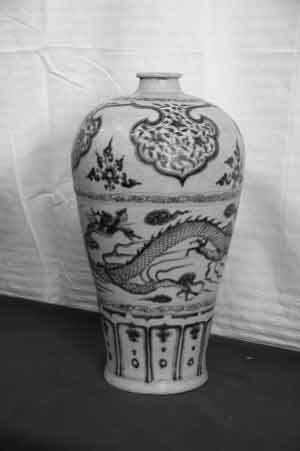 An expert explained that the techniques applied in blue-and-white porcelains did not mature until the Yuan dynasty, which created the extremely high artistic and ornamental value of the Yuan dynasty blue-and-white porcelains, and they are rare enough, so their prices have been rising steadily over the past hundreds of years. "According to available statistics, there are only 200 to 300 Yuan dynasty blue-and-white porcelains in existence in China, with only fewer than 20 in Shandong. Therefore, this nearly intact blue-and-white vase is undoubtedly the gem of the cultural relics in the sunken ship," the expert said.